High quality waterproof bag, fitted with our Klick Fast Carrying System Stud. The phone is usable in the bag as voice travels through the material. This bag is perfect for carrying the iPhone around on garments that have our sew-on Klick Fast Dock fitted. Easy to slide the iPhone in and out but also protects your device from the rain. We have also tested this with a Case-Mate rubber protective cover fitted to the iPhone, which makes the iPhone 4/4S 2mm thicker on each side and the case still fits but tightly (as seen in the photo). Bag comes without a mounting Dock, however if you do require a Dock then please view here. Fits the iPhone 4, 4S and 5, plus the Samsung Galaxy S2. Leather belt loop with spring clip, for hanging keys or torches, etc. Leather drop in style BlackBerry case with Klick Fast stud and 50mm belt dock. 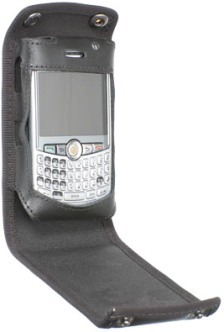 Leather fold up style BlackBerry Curve case with Klick Fast stud and two belt docks (38mm and 50mm). Please note that this case will not fit any other models.